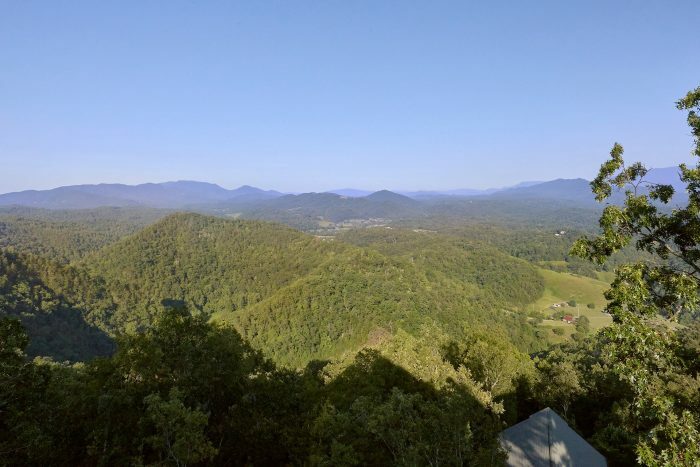 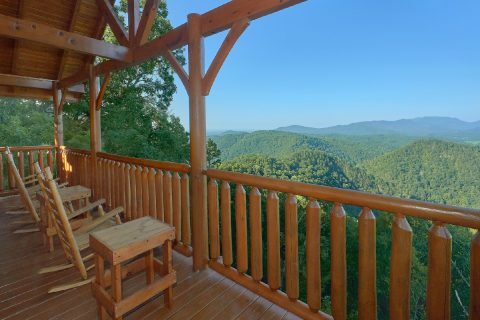 Welcome to "Blue Sky," an excellent 3 bedroom cabin rental that sleeps up to 10 guests in the Smoky Mountains of Tennessee! 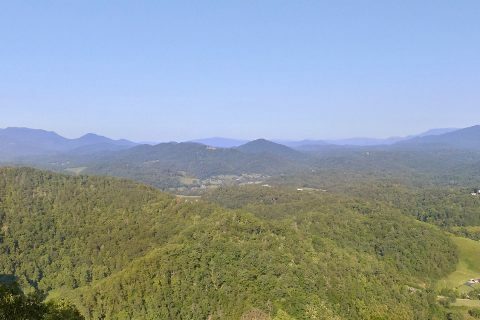 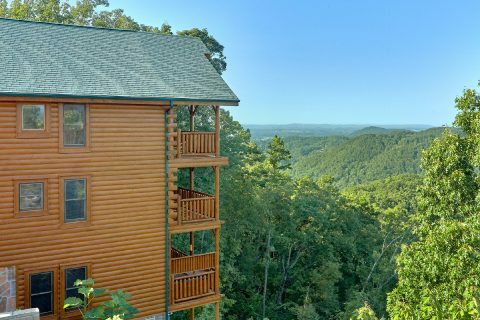 This Sevierville cabin boasts a beautiful location in the Legacy Mountain Resort area that's only a 7-mile drive from the heart of Downtown Pigeon Forge. 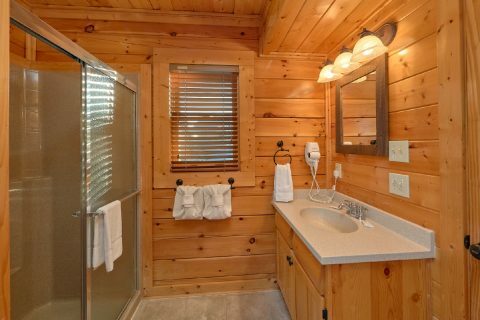 As a result, guests of this cabin can enjoy easy access to top local attractions while also savoring plenty of peace and quiet during their stay. 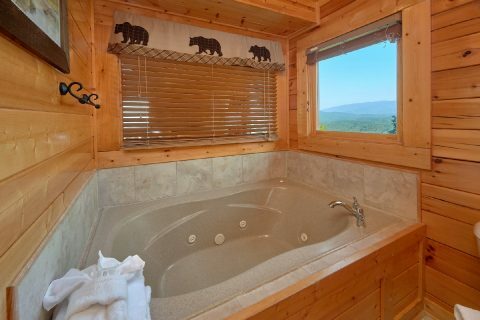 Of all of this cabin's features, the scenic mountain view truly stands out. 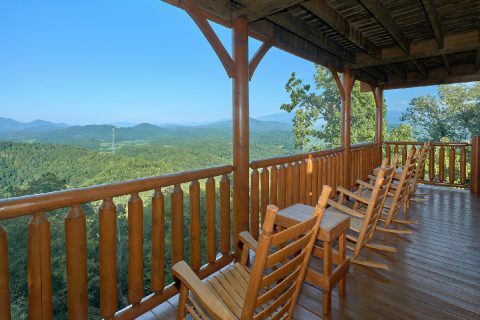 From this cabin's deck, you can enjoy the fresh mountain air and a nice view that goes on for miles and miles while you sit back in the hot tub or a chair. 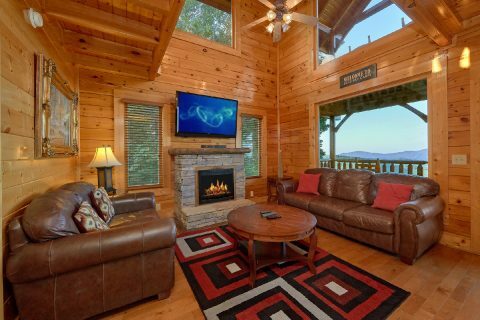 Inside the main level of your cabin, you'll find a welcoming living room area complete with comfortable furnishings, an electric fireplace, a television, high ceilings, and large windows to let in plenty of natural light. 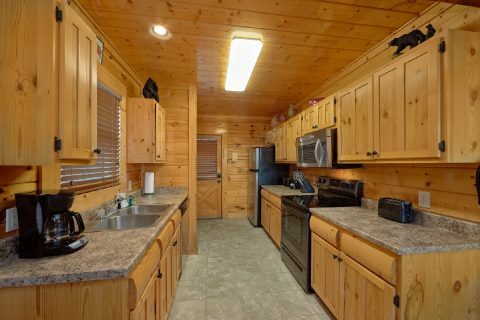 Nearby, your cabin's full kitchen and dining room give you the option to make delicious meals during your stay. 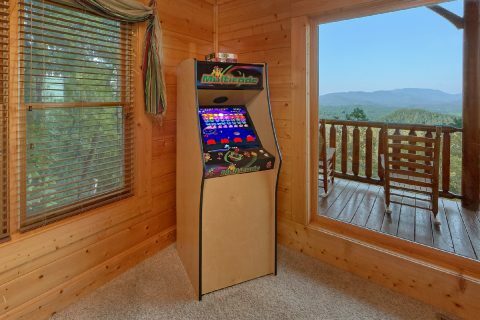 In your cabin's lower level game room, you can enjoy hours of entertainment on the pool table or the multi-cade arcade game. 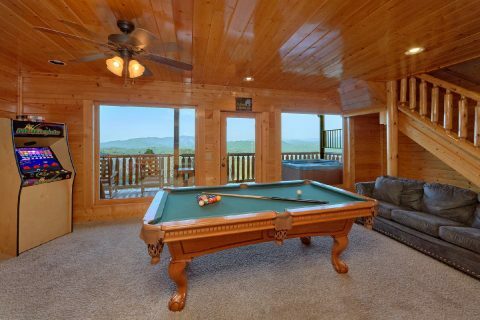 From this floor, you can step outside to the lower deck to take a soothing dip in the hot tub. 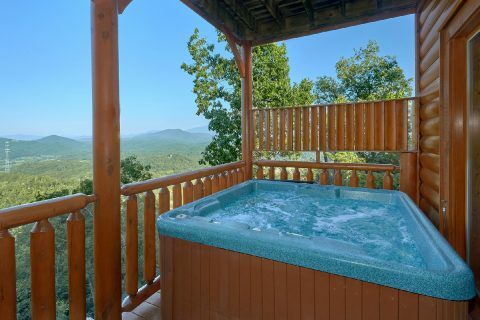 During the warm summer months, you can also enjoy swimming in the outdoor resort swimming pool. 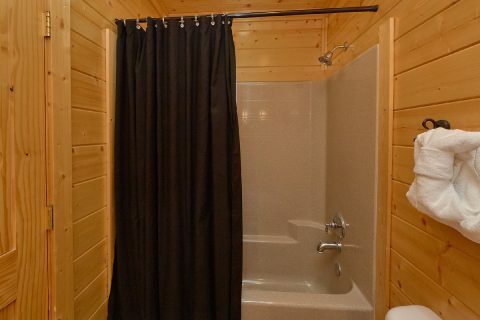 Guests will also have access to other resort facilities like the exercise room, a steam room, and a sauna. 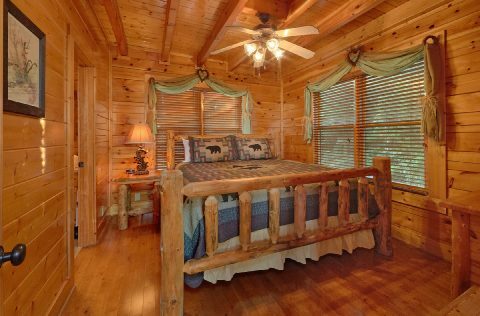 After a great day spent exploring fun attractions in Pigeon Forge or Gatlinburg, you can look forward to getting a good night's rest in your cabin's 3 bedrooms. 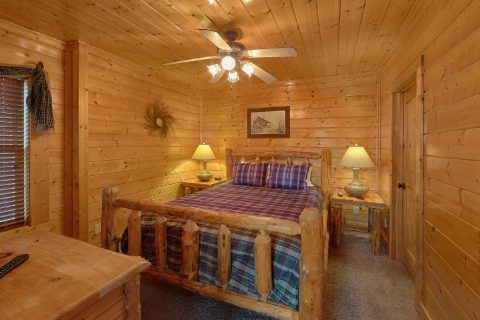 The main floor is home to a king bedroom suite with an HD TV and a private bath. 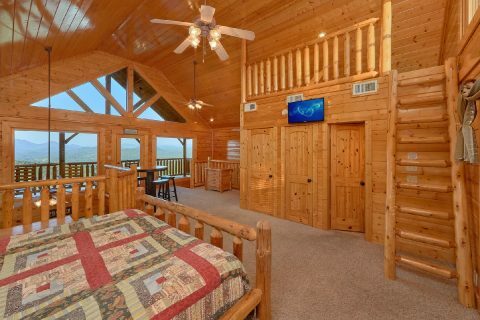 Upstairs, you'll find another king bedroom with an HD TV, a full bathroom, and a jacuzzi tub. 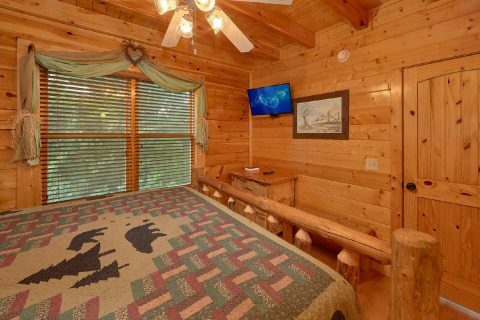 This room also features large, picture windows for enjoying your cabin's view. 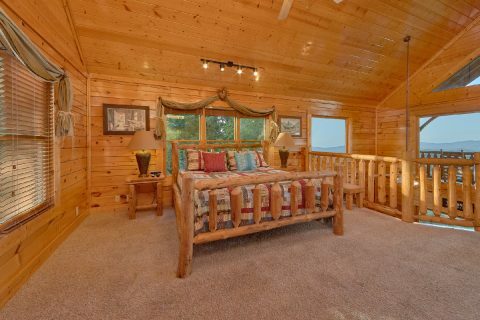 Lastly, this loft area has a smaller kids loft with a futon. 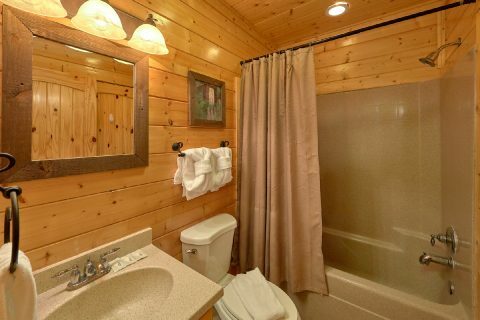 On the lower level of your cabin, you'll find another queen-size bedroom with an HD TV and a shared bathroom. 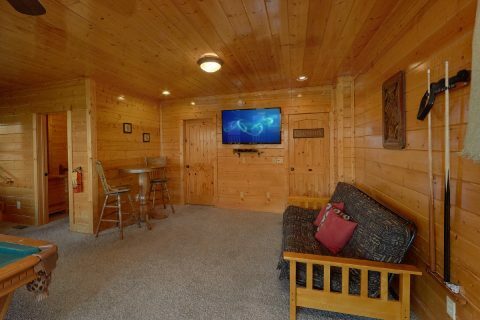 With a sleeper sofa in the main level living room and a sleeper sofa in the game room, this cabin can easily sleep up to 10 guests comfortably. 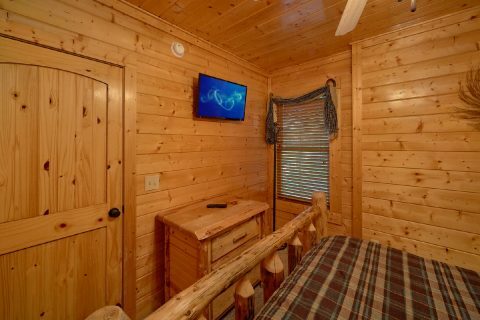 Lastly, "Blue Sky" provides useful amenities like a washer/dryer, a charcoal grill, and WiFi Internet so you can easily share pictures of your trip with friends and family back home! 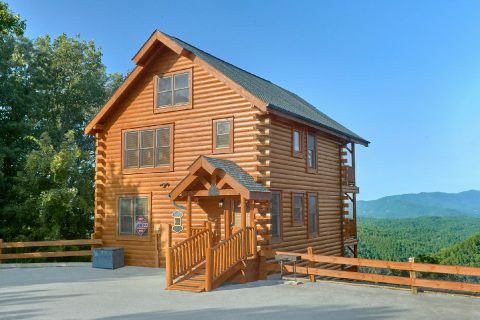 Book this premium resort cabin with a beautiful view and an outdoor swimming pool today with Cabins USA Gatlinburg and you'll save 15% on your nightly rate in the Smoky Mountains!